The zoo is an exciting place – and with ABC Animals! your child can bring all the animals home to play! 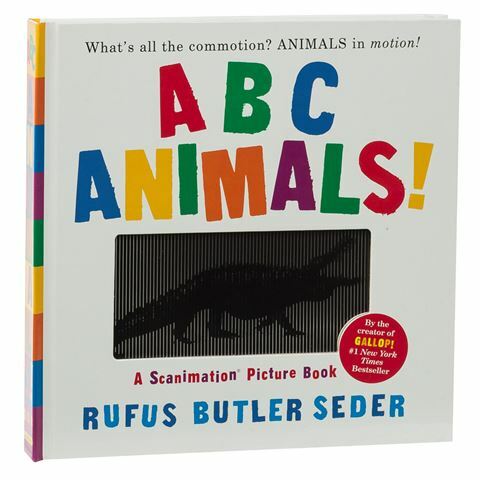 ABC Animals! is so much more than your average alphabet book. With fun rhyming text, your child will read about giraffes, lions, whales and alligators – and then watch them in action! The illustrations in this book move all by themselves as your child turns the page, thanks to the magic of Scanimation – a fascinating new technique that brings images to life. Your child will be so fascinated by the prowling lions and leaping whales they’ll find in the pages of ABC Animals! they won’t even realise just how much they’re learning! Scanimation images change as your child turns the page. Dimensions: 21cm x 21cm x 2cm.